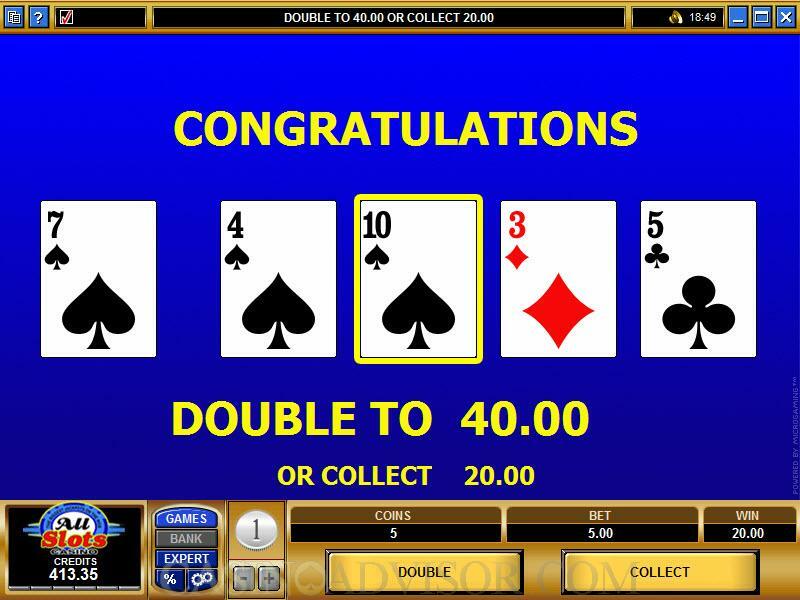 Joker Poker is another of those interesting video poker variations brought to you by Microgaming, which is the leading producer of online casino software in the world. It has a joker, which functions as a wild card and can be used to complete any winning combination. That means the software automatically converts the wild card to that denomination and/or suit that will give you the best payoff. The maximum jackpot payout in Joker Poker is 5000 coins, and that is achieved not necessarily with anything containing a wild card but with a natural Royal Flush. 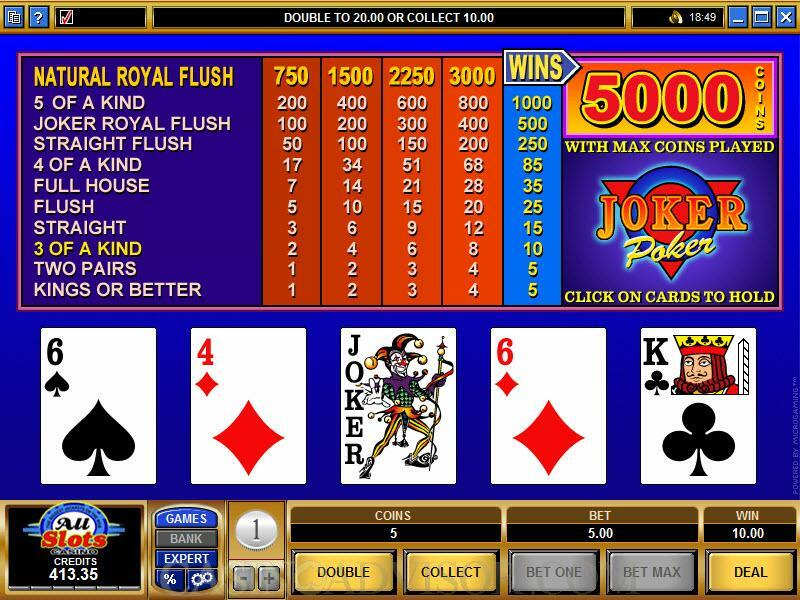 Joker Poker is played with 53 cards - there is the standard 52-card deck, in addition to a joker, which is a wild card and can, of course, be used to complete winning combinations. The cards are shuffled before each and every game, so you have a random deal. To make bets, you can use the (+) and (-) control, which incrementally serve to increase or decrease the size or your wager. By clicking "Bet One" you are wagering one unit times the size of your base wager, and when you want to bet the maximum, you just click "Bet Max.". It's very, very easy. By clicking the "Deal" button you get things rolling. You get five cards, and then decide which cards to hold by clicking them. Clicking "Draw" gets you new cards to fill out your hand. But there's another way to go. There is an option called "AutoPlay," available when you convert from Regular Mode to Expert Mode, and what this lets you do is to have your hands played out automatically, according to the best mathematical decision that can be made for any given set of circumstances. When you achieve the desired objective of a winning hand, you actually have a chance to increase your win. That is through the option of "Doubling," which is another great feature of this game. Doubling lets you choose a face-down card to go up against a dealer's face-up card. If your card is of a higher value, you win double the amount of your original win. You can keep doubling or decide to collect at any time. 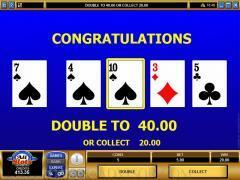 The biggest jackpot available in this game is as much as 5000 coins (contingent upon the maximum amount of coins wagered, of course), which happens when you get a "Natural Royal Flush," which is a royal flush that is put together without any help from wild cards. 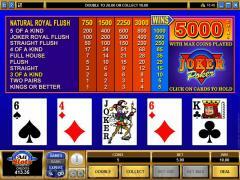 Interested in reading more detailed information about Microgaming Joker Poker? If so Click Here for more details.